All objects are attracted towards the earth by a force which is called The force of gravity. 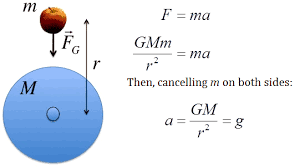 This force produces an acceleration which is called acceleration due to gravity and is denoted by 'g'. The value of 'g' on the surface of the earth is 9.8m/s^2. 'g' is an extremely important constituent of Physics and most of the Physics numerical problems involve the usage of 'g'.